Immigrants made headlines during the 2012 election. Latino, Asian, and Arab Americans voted in large numbers in districts across the country, and immigrant candidates carved new ground with historic victories in Texas (Cuban American Ted Cruz’s Senate win), Illinois (Asian American Tammy Duckworth’s victory in the 8th congressional district), and New York (Asian American Grace Meng’s victory in the 6th congressional district). The work of thousands of nonprofit organizations that registered and mobilized millions of immigrant voters received less media attention. George Pillsbury (2012) drew attention to this type of nonprofit work in his fall article on an agency-based approach to voter engagement. He argued that this approach shows promise because it is: integrated and less expensive, more personal, scalable, mission-based, and continuous. Whether this approach actually works to increase voter turnout has vexed researchers (summarized in Gerber and Green, 2008). Many tactics, particularly those used by traditional political parties that rely on simple phone calls or direct mail, fail to change voting patterns, especially for low-propensity voters. But more recent experimental research by Bedolla Garcia and Michelson (2012) shows that certain get out the vote (GOTV) efforts by community-based nonprofits offer great promise. When nonprofit organizations communicate with a likely voter in their preferred language by using multi-lingual volunteers and follow-up phone calls, there is evidence that that potential voter’s likelihood of voting increases—in some cases, by double-digit margins. Most recently, Kelly LeRoux (forthcoming) finds that nonprofits that engage in voter mobilization can increase turnout among their constituents. Given this evidence, what are the barriers to more nonprofits, particularly immigrant-serving nonprofits, from engaging in electoral activities? This article draws on interviews with the leaders of more than 50 national, state, and local immigrant-serving nonprofit leaders during the 2012 election. The findings focus on four challenges faced by these leaders: new regulations, funding, new technologies, and intra-constituents differences. Successful nonprofit leaders have sought to overcome these challenges with clever tactics. While these tactics are designed for their unique circumstances, other nonprofit leaders can draw lessons from them. In addition to changing the ways that individual voters could cast their ballots, some of these laws had a direct impact on nonprofit organizations. In Michigan, for example, legislators sought to amend their voting law to require nonprofits that registered new voters to comply with new regulations. An organization would have to register with a state agency, submit information to the state on all individuals who were registering voters, and complete a state voter registration training program. Michigan Gov. Rick Snyder ultimately vetoed this voter registration drive bill, but the efforts were indicative of the volatile environment in Michigan for nonprofit voter engagement activities. According to the Brennan Center, restrictions on voter registration drives passed in Texas, Florida, and Illinois, creating new hurdles for nonprofits. Lesson 1: Know the rules and adjust accordingly. For some nonprofits, these antagonistic policy changes stoked their enthusiasm for voter engagement, but available resources constrained how active they could be in adding new activities to their operations. Voter engagement work can be expensive and time-consuming, and it can necessitate expertise that many nonprofits simply lack. Cognizant of this, several national and state-level efforts have been launched to help nonprofits. For instance, in Illinois, the Illinois Coalition for Immigrant and Refugee Rights (ICIRR), an umbrella group of other immigrant nonprofits, developed an electoral fellows program to embed a temporary staffer in an organization during the election to work on civic engagement. Because elections are cyclical but infrequent, it is difficult for many nonprofits to staff electoral activities in a regular fashion. Short-term fellowships offer a way around this dilemma, particularly if a larger group such as ICIRR helps subsidize the salary. In addition to staffing needs, other nonprofits simply lack the expensive tools to do voting work. Recently, major foundations have coalesced around projects such Grantmakers Concerned with Immigrants and Refugees and the Four Freedoms Fund. These coalitions coordinated the work of hundreds of philanthropic foundations to support election-related activities. In particular, nonprofits that wanted to gain access to new databases with voter information could apply to be a part of a State Voices table through their Tools for All Fund. Without this external funding, many nonprofits would not have had the opportunity to mobilize voters due to a lack of key information and tools to identify where eligible voters live and how to reach them. Lesson 2: Join coalitions that can help access external funding. But the VAN was insufficient to meet the needs of other immigrant-serving nonprofit organizations. Despite its widespread use, the varied nature of certain ethnic names rendered the labeling of names nearly worthless. One interviewee said, “VAN is completely useless for the Asian American community,” in part because of the naming issue, but also because of the residential mobility of some segments of the community. That is, some addresses and phone numbers were changed too rapidly for the database to keep up. In one New Jersey congressional district, Salah Mustafa coordinated a coalition of Arab-American groups to register and mobilize voters in the Democratic primary between Rep. Bill Pascrell and former Rep. Steve Rothman. Mustafa said, “They gave us every name, everyone registered, but it took about three weeks of work, going name by name, sorting the data, cutting the data.”[v] He organized volunteers from several Muslim communities with the language ability to distinguish and code Bosnian, Turkish, and Pakistani names that the original database had not correctly labeled. Lesson 3: Capitalize on technology, but be skeptical. One of the chief challenges facing many immigrant-serving nonprofits is the cultural acceptance of advocacy and political engagement. Some communities are steeped in traditions of political activism, while others are dubious and even suspicious of politics. Kathleen Fernicola, policy director of the Asian American Institute (AAI) in Chicago, said that some of their constituents come “from countries where the political culture is violent [and/or] dysfunctional. Some have family stories that relatives have been dragged out in the night because they tried to engage” in the political realm. [vi] For AAI, there is a need to confront the ambivalence many of their constituents feel about politics and to adjust their tactics and expectations accordingly. Lesson 4: Know your audience. These four challenges and lessons are drawn from the electoral experiences of immigrant-serving nonprofits in 2012, but likely do not come as a surprise to nonprofit leaders serving other constituencies. Many of the same difficulties associated with adopting a new voter engagement program would be faced in adopting other new programs. The same prickly political climate for registering new voters might also be faced by those working on issues of reproductive rights, environmental protection, and declining state support for education. The imperative to do voter engagement, though, stretches across nonprofits in all sectors. 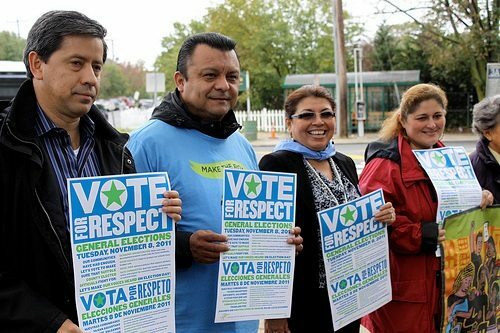 While immigrant-serving nonprofits may face a particularly strong call to action because of the position of their constituents, other nonprofits—such as those serving women, teenagers, and the elderly—should also evaluate whether voter engagement, in particular, and advocacy, in general, fits within their nonpartisan mission. Heath Brown, Ph.D., is assistant professor of political science at Seton Hall University, where he teaches courses in nonprofit advocacy, public policy, and research methods. He is the author of Lobbying the New President: Interests in Transition (Routledge, 2012). Bedolla, L. and M. Michelson (2012). Mobilizing Inclusion: Transforming the Electorate through Get-Out-the-Vote Campaigns. New Haven, CT: Yale University Press. Green, D. and A. Gerber (2008). Get Out the Vote: How to Increase Voter Turnout, 2nd Ed. Washington, DC: Brookings Institution Press. LeRoux, K. (forthcoming). Can Organizations Increase Voter Turnout? Findings from an Agency-Based Voter Mobilization Experiment. Nonprofit and Voluntary Sector Quarterly. Pillsbury, G. (2012). Serving Democracy: Nonprofits Promote Voter Engagement in 2012. The Nonprofit Quarterly, Fall: 12-19. [i] Based on phone interview with Doua Thor, July, 2012. [ii] Based on phone interview with Leticia de la Vara of One Arizona, July, 2012. [iii] Based on phone interview with Navdeep Singh, July, 2012. [iv] Based on phone interview with John Albert, July, 2012. [v] Based on phone interview with Salah Mustafa, December, 2012. [vi] Based on phone interview with Kathleen Fernicola, February, 2012. [vii] Based on in-person interview with Maria Teresa Kumar, June, 2012. [viii] Based on phone interview with Ali Najmi, July, 2012.